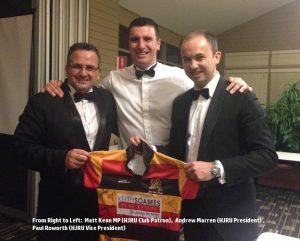 Club Patron 2018 | HJRUC Patron MP Matt Kean has been the club patron from 2014. Hornsby Junior Rugby Union Club Patron 2018 is MP Matt Kean. Message from Matt Kean MP – club patron 2014 to today. It is both an honour and a privilege to be named as Hornsby Junior Rugby Union Club’s patron in 2014. As a former junior rugby union myself I know first-hand the great skills and attributes which are nurtured and developed playing this wonderful sport. Hornsby Junior Rugby Union Club has a long standing tradition in the Hornsby Shire for its professionalism both on and off the field. I commend the hard work and dedication of the club’s staff in promoting the code’s grass-roots participation while also upholding the game’s core values such as discipline, leadership and respect. Recently, I had the great pleasure of attending my first Lions training session where I was presented with my very own club jersey and rugby ball. I look forward to supporting the club in the future and cheering on the mighty Lions this season. Good luck and go the mighty Lions.